Ubisoft has finally lifted the lid on what this Far Cry Primal business is all about: It's a first-person "shooter" set in the Stone Age and scheduled for release in March 2016. 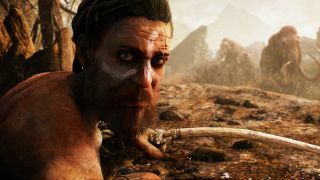 "Welcome to the Stone Age, a time of extreme danger and limitless adventure, when giant mammoths and saber-toothed tigers ruled the Earth, and humanity was at the bottom of the food chain," the description at FarCryGame.com states. "You will play as Takkar, a seasoned hunter and the last surviving member of your group. You have one goal: survival in a world where you are the prey. Grow your tribe and hone your skills to lead your people, conquer the land of Oros, and become the apex predator. Encounter a cast of memorable characters who can help push back the dangers of the wild. Face enemy tribes who will do anything to eradicate you and your allies." The reveal trailer is more of a table-setting than a meaningful look at what's in store, but Ubisoft was kind enough to also provide a "behind-the-scenes" video, playing below, that digs deeper into the game. Oros is a "savage and primitive world," filled with numerous dangers, which Takkar will arrive in alone, exhausted, and unarmed. Instead of purchasing weapons, players must craft them, first with wood and stone, and later with more and different resources, for more advanced and powerful equipment, like spears, bows, blades, and clubs. The game world will be large but "dense" with various interacting systems, some of which will be "greatly affected" by the day/night cycle. So it's Far Cry, but with no firearms and no vehicles. That's a bold move, but one I'm looking forward to, even if it might not be as exciting (no dinosaurs) as some of yesterday's predictions. Far Cry Primal is set to come out in March 2016. Don't miss the screens underneath the trailer!